Have lots of paper towels handy. This is going to be messy, since you're working with wet clay, water and your fingers will be covered before long. Unless you're working on a table you don't care about, make sure you have some sort of covering on it. I usually use wax paper.  This is also going to be a two-part tutorial. In this one, we will be forming the rock formations and then in the follow-up, we will be painting them. So stay tuned! First up. Pick a base that'll fit with the size you're going for. 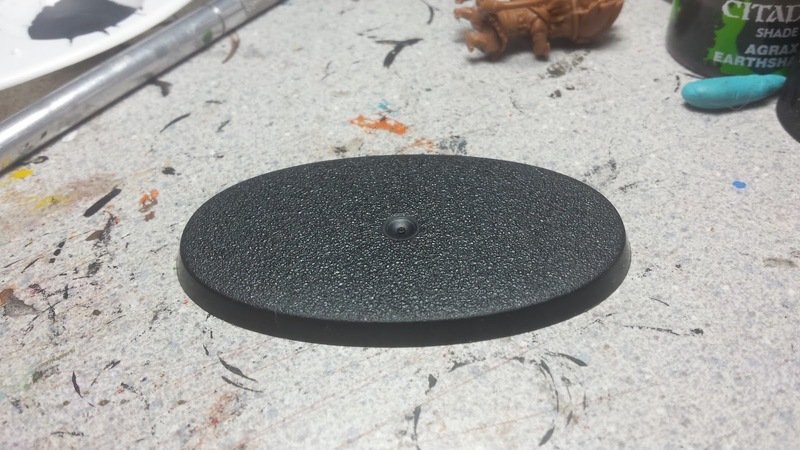 For this one, I'm making a scenic base for a Ninja All Stars miniature and have chosen a Games Workshop oval base. Next we use cork and super glue and begin layering up the inner structure of the rocks. You can do any shape you desire, and the more uneven and random it is the better. With the cork all glued into place, we then start applying the clay. I usually keep a bowl of water nearby to help smooth the clay over. Just liberally apply it over the cork frame work and make sure to cover it fully. 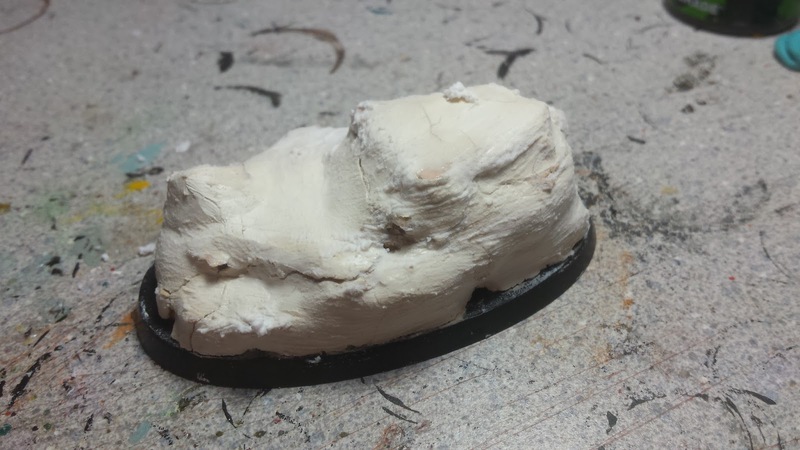 Also make sure you cover at least some of the base to help tie them together visually. Let it dry fully, which usually takes over night. 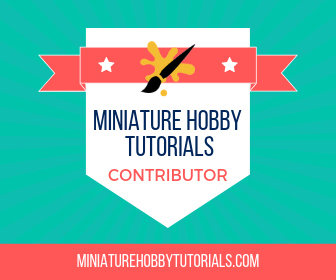 Apply White Glue to Clay and Cracked Areas. Overnight the clay will crack a little while drying. To help combat this, I apply white glue over the entire piece, and fill the cracks with glue as well. Don't worry if the clay lifted off the base. 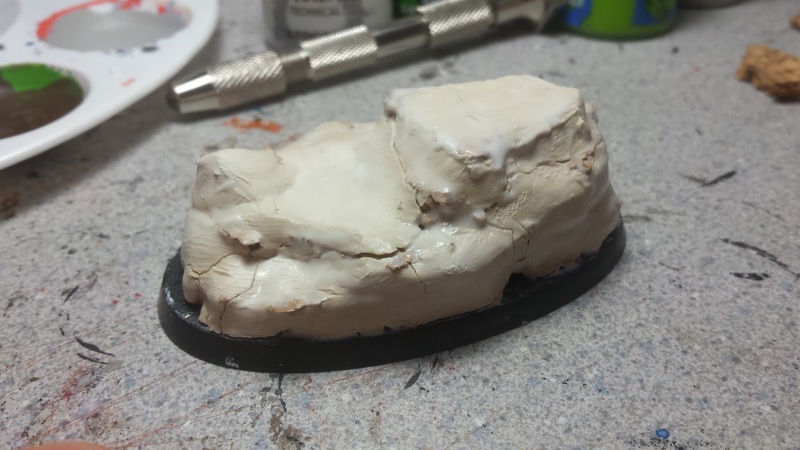 You can apply some glue under the lifted section and then push down on it to crack it away from the rest of it, gluing it down and turning it into a new stone of it's own. Next up, we take our 1" Chip Brush (those cheap <$1 paint brushes you can find in the paint department) and apply drywall filler over the entire piece. I also wet the bristles down a little to help the stuff spread. This helps give the rock a more realistic surface texture and If you want to add more fill to any cracks you can do so. 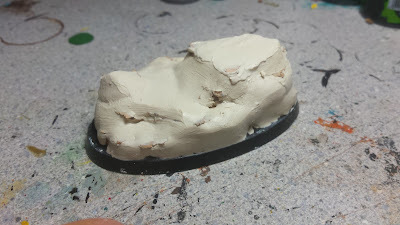 Depending on how the rock looks after it's dry, I'll sometimes go over it a second or third time to give it more texture. On this one I only did one coat. 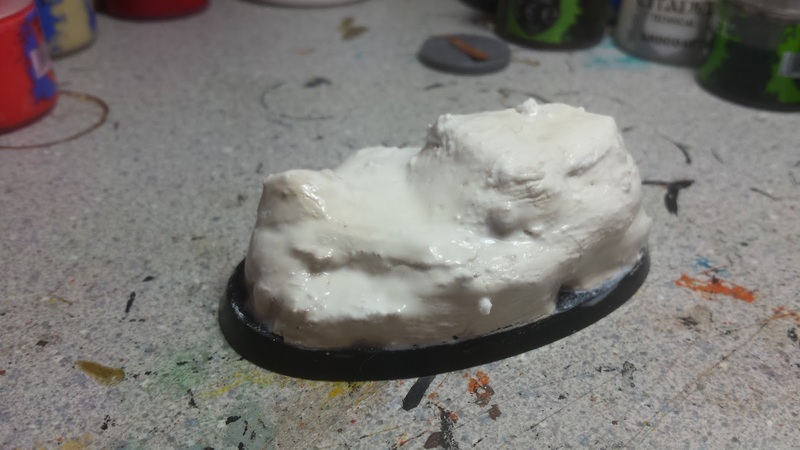 To help keep the rock strong and keep the clay and drywall filler from chipping off from regular handling, I go over it with more white glue. It doesn't need to be thick, just something to act as a little bit of a protective shell. That's it! We now have a nice custom made rock formation all ready for paint. In the next tutorial, I'll go over how to paint it using a bit of paint and washes for a really nice effect. That should be up late this week. For now, feel free to comment below or you can always catch me on Twitter @ryglore or on Instagram. Great tutorial. I did the same thing on my Knight. It's so easy and looks great. 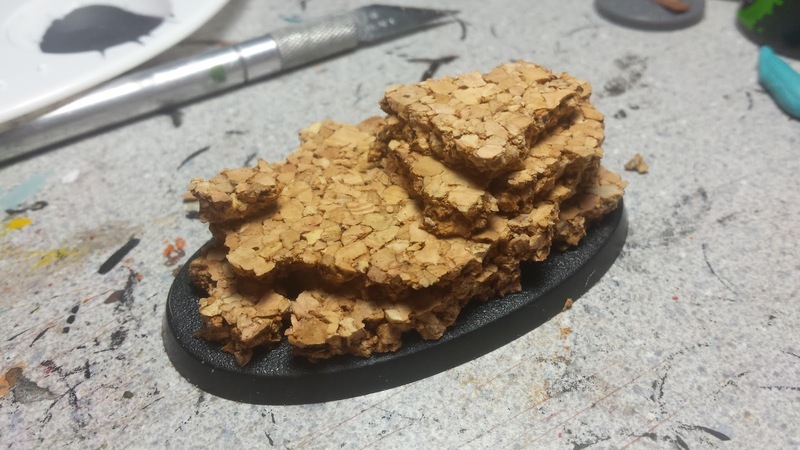 Plus, it bugs me seeing people just using plain cork on a base. I mean, plain cork doesn't look bad, just uninspiring. I agree, Cork alone doesn't look horrible for ground, such as lava rock or something. But I'm not a huge fan of it by itself.